StockWatch Share Trading Game. Play Now! Welcome Play the exciting game! Game Info See the features! 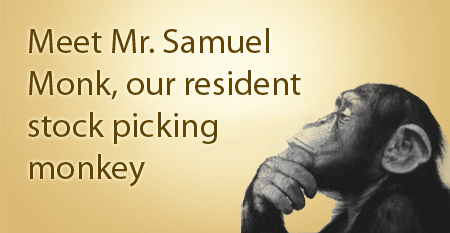 Mr Monk Can you outperform a monkey? Sign Up for Free Play Now! 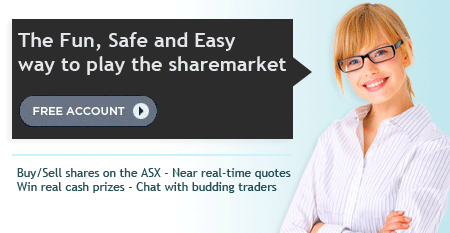 Want to learn about investing in Australian shares in a fun and exciting environment? Welcome to StockWatch.com.au, the best way to practice your new investment techniques and strategies with zero risk. The website aims to teach share trading to beginners with our unique share trading game and a wealth of investing resources. It’s free and very easy to use. 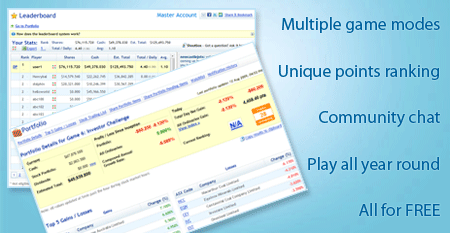 The game is a share market simulator- mimicking the Australia Stock Exchange, ASX. Our Share Trading Game allows the investor to buy and sell stocks with almost real-time market data; you can also track your profit or loss progressively and even view your trade history, just like the real thing! If you have been thinking about buying shares but don't feel confident enough, sign up to the Share Trading Game. There’s no better way to learn than to get your hands dirty. Play the game, learn about investing and see how you stack up compared to other members and friends - it’s all FREE! If I could only pick one investment to put my money into – what would it be? Precious Metals? Technology, Oil or Food? How do you go about buying or shorting the S&P/ASX 200 index in an efficient manner? NEWWhat are E-Minis Futures? How do I Trade Them? Albert Einstein called it the 8th Wonder of the World. Compound interest is one of the most basic and powerful concepts that can enhance the outcome of your investments. This options trading series will teach you very important aspects of options. The part series 'Introduction to Options' will teach you tips and strategies for trading options. Competitions Running: Prize money to be won! Can you outperform a monkey? "Can’t wait until me cheque arrives ... I LOVE THIS GAME"
"Great work...love the new ranking system"
"I'm enjoying the analytical side of investing." "After growing this virtual portfolio by about $11k in the past month I’m taking this to the real ASX!" "…b4 I started on this website I had no idea how any of this worked." *"I know it's a competition but part of the reason why we come on here is to learn the craft without fear…"
"What a great game we have here!" "Wow i love the new look of the game !! Thanks guys, keep up the awesome work"
"Investing is just a sideline, but if it becomes successful enough, could maybe become the main game." "It is a pretty good points system." "Thanks, if it wasn’t for this site I woulda never have known anything. So thank you." "After the first day on the real ASX I'm up $330... early days but so far, so good :D"
"Having always played the ASX Share Market Game, I much prefer this. How I love AJAX"
"I’ve made about 5k yesterday & today. Ranked just under 200, I’ve got the kids playing it as well to teach them"